My question: is there a different symbol that could be used to describe an attachment? 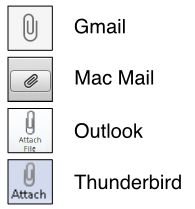 I'm not complaining; I think the paperclip is quite an elegant symbol, and it is obviously widely recognised or is would not be so ubiquitous. I'm just wondering if there is an alternative. Personally I use staples rather than paperclips, because I find they hold sheets of paper together more reliably. The symbol has become so ingrained with everyone using either email, the internet or any kind of SaaS since its conception. I am certain there is no universally recognized alternatives for the attachment function. This is a convention that is well known by users across cultures, and is generally a very clear signifier. I guess it comes down to, "If it ain't broke, don't fix it!" Not the answer you're looking for? Browse other questions tagged icons email or ask your own question.